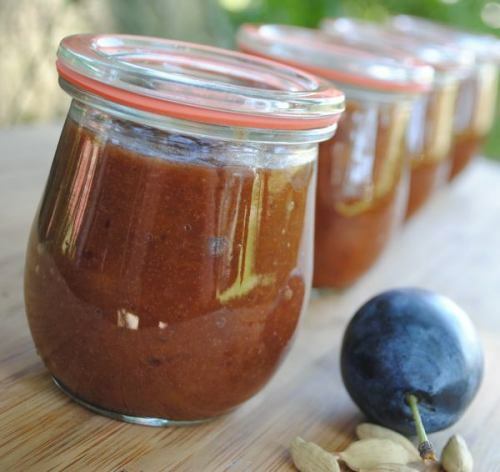 I found my inspiration for this jam earlier last week on the Grow It Cook It Can It blog. Of course I couldn’t leave it alone, and had to play around with the idea until I created something that was mine. 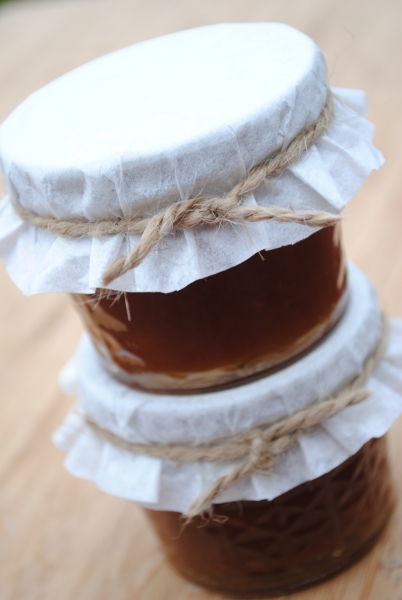 I like to make old-fashioned cooked jams, so I almost always remove the pectin from a recipe. I also prefer to use honey in place of sugar. 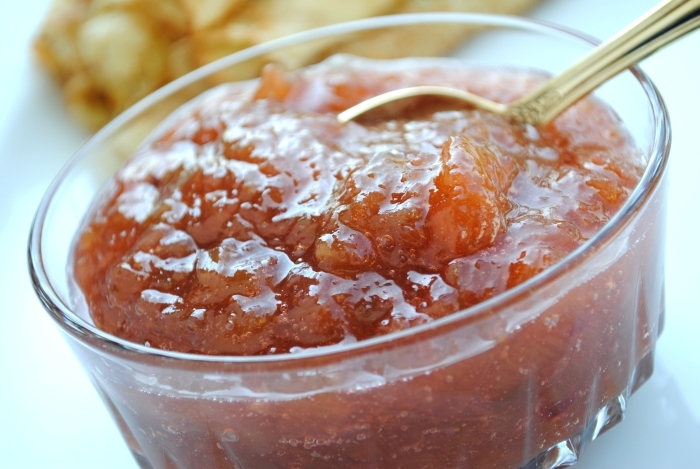 Also, last year’s experiment with Salted Butterscotch Peach jam taught me that a bit of salt has it’s place in jam. There’s no way I can top my inspiring blogger’s post on her jam, and the wonderful poem by William Carlos Williams , so I’m not even going to try. When I give some of the measurements, notice that I indicate amounts “up to”. The amount of honey, lemon juice, and spices will depend on the ripeness, sweetness, and acidity of the plums. These factors can vary quite a bit, so I always taste as I go. My plums were perfectly ripe and very sweet. I used only 1 cup of honey and the juice of 1/2 a lemon. Also, I found that only 1/2 ounce of the chocolate gave me what I wanted without overwhelming the flavor of the plums. If you’ve never cooked with cardamom, let me warn you that a little can go a very long way. If you’re using store-bought ground cardamom, you’ll probably end up using a whole 1/4 teaspoon. If you split the pods and grind the seeds like I do, then you’ll need less. One last note, because this is a cooked jam, the volume will reduce by almost half … another reason it’s important to go easy on the spices, taste as you go, and adjust at the end of the cooking (if needed). To make skinning plums easy, drop them in boiling water for 30 to 60 seconds, and then remove to ice water. Place plums in a wide shallow pan over medium heat. Add honey, lemon juice, and cardamom. 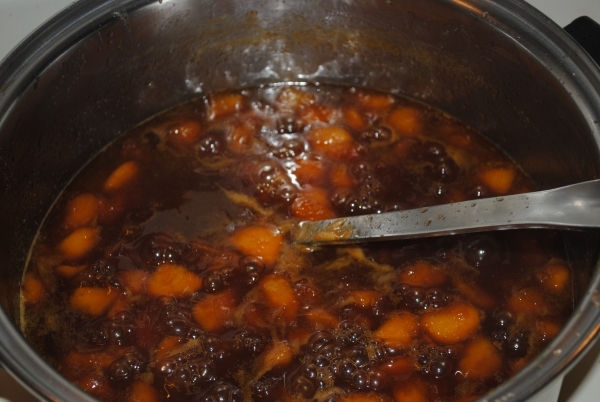 Once the mixture reaches a boil, turn the heat down and simmer for 30 minutes to an hour, or until the plums reach the desired jam like consistency. Add grated chocolate and stir to incorporate. Add salt to taste. If you would like to can the jam, prepare jars and lids according to standard canning practices. Process for 10 minutes in a boiling water bath canner. This peach jam is amazing! It’s so amazing that I’m going to have to make more. My family loved it so much that I only have these two little 4 ounce jars left a little over a week after making it. That’s just two little 1/2 cup jars! They demolished the stuff!. It’s wonderful on ice cream. It’s also good on waffles, and it passed my 15 year old son’s peanut butter and jelly sandwich test. From a cook’s standpoint this recipe was especially fun, because I got to see how it evolved, as each cook put her own touch on it. The original recipe comes from Mary Ann Dragan’s Well Preserved: Small Batch Preserving for the New Cook I found the recipe reprinted a couple times on the net by the time my friend Maggie got her hands on it. It was Maggie’s idea to transform the recipe into a sweet and salty treat. 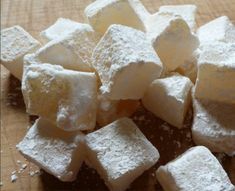 I loved Maggie’s idea, but the more I looked at the recipe, I realized I wanted it to be truly butterscotch and it was going to need an addition of butter and vanilla. After all, butterscotch isn’t butterscotch without BUTTER! So I put my own spin on the recipe. Maggie and I share a similar cooking style in that we follow measurement’s very loosely and go more by taste. 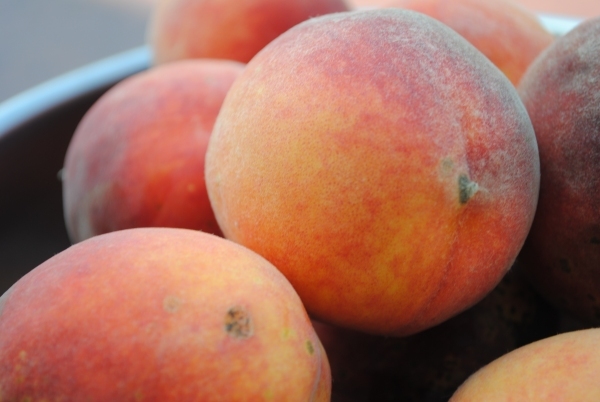 The measurements I give allow for differing ripeness of your peaches and personal preference. For instance, I didn’t use quite as much salt as Maggie because I have relatively sensitive taste buds, and don’t like my food uber salty. Also, my peaches were very ripe and sweet, and didn’t need as much sugar. These peaches were a surprise gift from my neighbors who got them from their parents’ unsprayed tree. Local and chemical free …. the best way to go. First peel and pit your peaches. 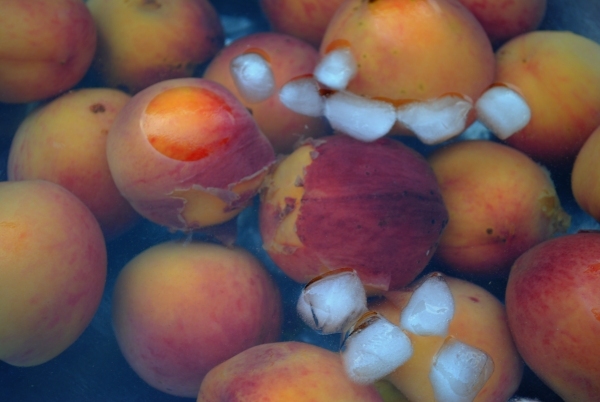 The easiest way to do this is to drop your peaches into a pot of boiling water for 30 seconds to a minute, and then remove them to an ice water bath with a slotted spoon. Work in small batches and make sure you bring the water back to a full boil between batches. After scalding, the skins should slip off relatively easily. Split the peaches in half with a knife, remove the stone, and chop the flesh. I know Maggie left her skins on, but I just can’t stand peach skin. I even peel fresh peaches before eating them. At this point, I removed the jam from the stove and set it aside to let it cool while I fixed dinner. I did this for two reasons. First, my family was hungry and things were about to get ugly. Secondly, I can’t properly taste anything if it’s too hot or cold. Since I was going to be adding salt I wanted to be sure I got it right. Also, by cooling, I was able to see if the consistency of the jam was too my liking. After dinner I assembled my water bath canner, jars, lids, and other canning accouterments. Then I added my salt to taste. You should do the same. You might want more, you may want less. The point is you want it to taste good to YOU. Once the flavor was to my liking I brought the jam back up to a simmer, poured it into my hot jars, and processed. If you’re unfamiliar with the canning process, there are many good books and online tutorials. A quick online search should give you more than you ever wanted to know.